Awesome Location. Clean rooms. And friendly staff. Located right in the heart of the Red Light District. I stayed in an 8 person dorm room, the stairs up to it were extremely steep. The room itself was spacious with each bed having a security locker but it was not big enough to store a carry-on sized luggage. My biggest con was that there was only one bathroom and one shower (both in the same area so only one person could use at a time) for the entire room. This created time issues when everyone got up and wanted to get ready in the morning. The hostel was good! The front desk people were friendly, didn't go out of their way to help us and give us recommendations like some hostels do, but nonetheless they were helpful. The room was fairly clean, the lockers were too small to fit a suitcase but I didn't have any issues with security. Location was great! Easy to find, right in the red light district and great for walking to wherever you need to go. 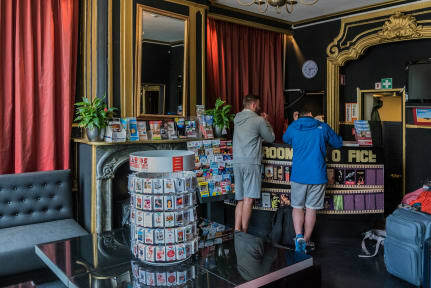 Overall a good hostel for a weekend in Amsterdam. All in all a decent hostel excellently located in the middle of the city. Clean rooms and our en-suite bathroom in particular was good. The TV in our room did not work and the staff at the desk were very rude at check in and generally throughout our stay however. My friend I stayed in room 20, which appears to be right at the main street of de wallen (the red light district). I actually didn‘t mind that, but i would have loved if the hostel informed people how incredibly THIN the walls are. I heard every person walking outside the window, screaming, partying, playing music which made it impossible for me to sleep during the first night of my stay. When the staff refused to switch our room, we used lots of weed and earplugs to sleep much better. Location was great, but everyone that we shared a room with went to bed by about 9pm! So we couldn’t spend much time in our room and we had to be silent when we came back. 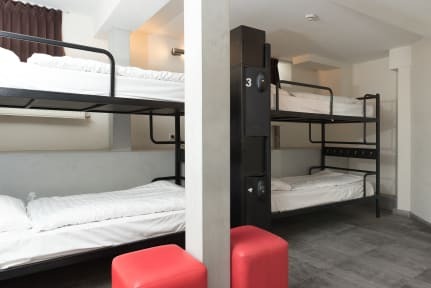 This hostel is very misleading in its photos. There’s supposed to be a movie theme for each room. All there was was a blurry picture of a screenshot from a movie. The room wasn’t clean, I saw stains on “clean” sheets, and the bathroom’s faucet was not properly mounted to the sink. They also need to change there dining room policy. I couldn’t use the kitchen, but I at least wanted to eat at a table. I was rudely told that I couldn’t be there and would have to eat my food in the lobby. Just no.